Over the years I have been involved in the infrared industry I have seen some mistakes made and problems missed using spot temperature measurements on IR cameras, luckily these were rectified using the IR software when the reports were written… (would not have been the case had we been using “report by exception” techniques!). 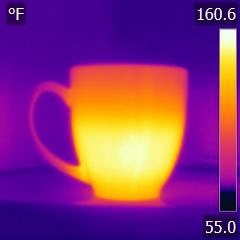 A simple way to check the transmission rate of any infrared window is the “coffee cup test.” Use this test before your initial installation and during regular IR window maintenance for windows with materials that are known to degrade over time. How do YOU perform an infrared electrical inspection?